I discovered Lindy Gravelle quite by accident while researching a piece on Patsy Cline a few years ago, and talk about your lucky finds, well, she certainly was one of mine. I now know that Gravelle is not only one of the best singers anywhere, she is also an accomplished pianonist, and a resplendent songwriter. She wrote one of my favorite country songs of all time, “A Bottle of Wine and Patsy Cline”, which was most recently recorded by newcomer, and Texas Music Awards Female Vocalist of the Year winner, Crystal Sands. 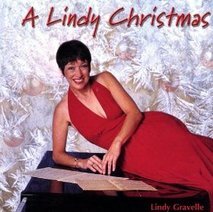 On A Lindy Christmas, Gravelle not only sings but also wears the hats of Co-Producer and Arranger to deliver her own wonderful version of thirteen of the greatest Christmas songs ever written. The album kicks off with “Winter Wonderland” then takes you on a delightful musical journey via a “Tennessee Christmas” before continuing this heavenly nostalgia trip through nine more classic tunes including “I'll Be Home For Christmas” and “O' Holy Night”. The album ends with her angelic rendition of “Silent Night”. Gravelle did write one song for this album, “Christmas Corsage”. The song was definitely a sentimental journey for me and I'll bet it is a nostalgic trip for a lot of other folks too, especially if you ever purchased one of those fake, little Christmas corsages for someone. If you have, this song is certain to strike a memorable chord that will generate a smile or two. I remember going to Woolworth's as a child and spending my entire weekly allowance, all fifty cents of it, on one of those plastic, poinsettia pins for my Grandma. Gravelle was born and raised in Oregon. She showed her propensity for singing at the age of three and by the age of eight she was already a regular member of the Leonnig Family Band, comprised of her parents, two sisters, and two brothers. In 1985 she moved to Nashville where she was gainfully employed as a singer, songwriter and performer. It was there she wrote A Bottle of Wine and Patsy Cline which was recorded by Marsha Thorton and it quickly made its way to the Top 40 Charts. Despite the noteritety created by this song, and additional success of another of her songs, “Exit 99” from Lorrie Morgan's gold album, Warpaint, the pull of Oregon finally won out. She returned there and still resides there today. Her absence from Nashville hasn't hurt her creativity or productivity. In additon to her Christmas album, she currently has nine CD or music projects listed on her website. She also has two videos. “Heaven” is a beautiful song about losing someone and “I Love My Dog” was selected by the Hollywood SPCA to be the background song for a video titled “Cinema Dogs”. If you are looking for a great stocking stuffer, look no further. A Lindy Christmas is sure to become a traditional favorite.